In the girls cross country races at the state meet, Aspen's Nina Biedleman led the way for the Skiers. The Aspen Skiers had to overcome more than the competition at the 2014 CHSAA State Skiing Championships at Eldora Mountain Resort near Nederland. The Skiers also had to overcome difficult weather conditions to bring home one state championship trophy and one state runner-up trophy. “The kids skied overall really well,” Aspen nordic coach Travis Moore said after the Aspen boys won the 2014 state title and the Aspen girls finished a close second to perennial power Summit High School (located between Breckenridge and Frisco in Summit County). The Aspen boys totaled 624 points to win the boys state title. They were second as a team in both cross country races (classic and skating). And the Aspen alpine boys, coached by Craig Carlson, finished second in GS and third in slalom at state. “In the boys, I had five different guys score. It showed that we had the depth on the boys side that I didn’t know was there,” Carlson said. The Aspen High School girls ski team finished second to Summit as the Tigers won their 12th state title in program history. The Aspen girls won the giant slalom event as a team and finished third in slalom. The state championship for the Aspen boys was the seventh in school history — all since 2000 when AHS joined the Colorado High School Activities Association ski racing program. The Aspen boys last won state in 2012. For the girls, Summit won with 665 points. Aspen was next at 648. The Aspen boys in alpine were led by Luca Woehrle, who finished second in both the slalom and giant slalom. Steamboat Springs’ Peter White won the boys’ Skimeister award, given each year to the top overall skier based upon a season-long competition in all four ski events. Aspen’s Max Marolt finished second to White in the Skimeister competition. Graham Houtsma of the Skiers finished fifth in the overall Skimeister scoring, according to Carlson. In the boys giant slalom, Marolt finished seventh for the Aspen boys. Kyle LaCouture was 14th, and Scott Houtsma finished 17th. In the boys final skating cross country race, Aspen was led by Nick Sweeney in sixth. Ben Belinski was ninth. Sweeney also led Aspen in the classic race when he finished fourth. Teammate Ford McClure was 12th. 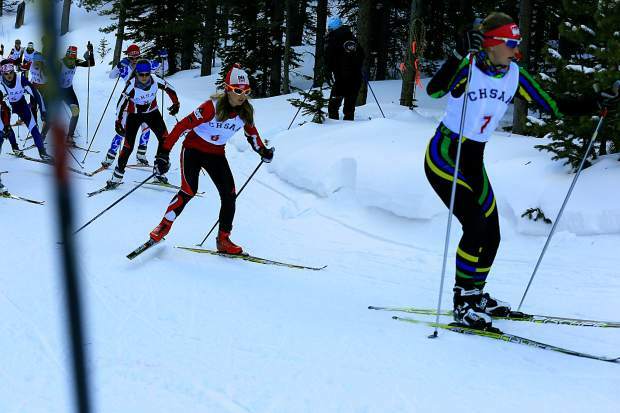 Nina Beidleman led the Aspen cross country skate-skiers at state. She finished fifth in the state championship finals. Teammate Hannah Dodge was eighth, and Logan MacNamee was ninth. Else Dodge was 13th for Aspen. In overall season-long awards, Nederland’s Bailey Kuechenmeister won the girls state Skimeister award for the third consecutive year. She is the state’s first three-time girls winner. In the girls slalom, Anne Parker of Summit finished first with Nederland’s Keile Kropf second. Aspen was led by Hanna Mass in sixth and Anna Patterson in seventh. Mass finished third in the girls GS. “This will be a good stepping stone for these athletes,” Carlson said. “At the end of the day … they had all skied great, and they were so happy,” Moore said of the Skiers.